Hans-Jakob Füglister, the company founder was always enthralled by organ-makers. As a young boy on holiday at Valais, Hans-Jakob Füglister saw traditional organs and observed the work of the Carlen family, one of the two famous families that produced organs in the Valais area. He became a master craftsman and forged his reputation following high-level training and experience gained throughout Europe. He undertook advanced studies in piano and organ, specifically with Gaston Litaize in Paris in 1956. He then studied organ-building at the world-renowned METZLER Manufacture at Dietikon in Switzerland. He continued his studies by specialising in organ-building with Rudolph Von BECKERATH in Hamburg, Germany, then with Troels KROHN at Hillerod in Denmark. He scoured Europe to study different instruments and styles and he now lectures on the subject in Switzerland and elsewhere. Building on his experience, he founded his company in 1960. 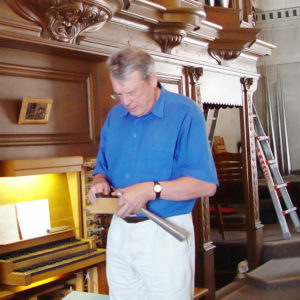 His wife, Marianne Füglister-Krohn, whose father is the famous Danish organ-maker Troels Krohn, joined the company in 1964. The company enjoyed speedy growth and currently enjoys a fine reputation throughout the world. Its renown extends far beyond Swiss borders and is well known as far away as Japan. Hans-Jakob Füglister died in 2012. Hans-Jacob’s daughter, Annette has taken up the challenge. Fuelled by the same passion for organ-making, she has been working with her father since 1987. She obtained a CFC qualification from Mathis at Glaris (CH) in 1991 and, Danish being her mother tongue, she went on to pursue specialised studies with Carsten LUND in Denmark. Having completed her higher studies, she came back to the Valais region to help her father with the ambition of taking over the business and perpetuating the family tradition, which now extends to three generations! In 2006, the company became a SARL, a limited company, headed by Annette Füglister Sermier.